This Wednesday, Word for Word Author brings you four promising debut authors, including one whose work has just hit The New York Times Bestseller list. Before his appearance in the Reading Room and debut on the bestseller list, Amor Towles, author of Rules of Civility, takes a moment to answer our Blog Q&A, where we discover his interests in Faulkner, Mary Tyler Moore, and the semicolon. The idea for the book came to me twenty years ago, when I first saw the portraits that Walker Evans took on the New York City subways with a hidden camera in the 1930s – and I imagined someone recognizing an old acquaintance when the portraits were first shown at MoMA in the 1960s. I do some of my best inventing, outlining and editing when I happen to be alone in one of the cafés or restaurants of lower Manhattan. I’ve wanted to write ever since the poet David McCord came to read his poems for children to my first grade class. I can recall the plots of virtually every episode of The Mary Tyler Moore Show, Star Trek and the Rockford Files. 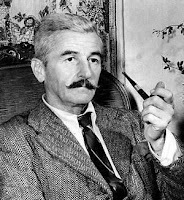 William Faulkner – but the post-Hollywood, slightly hung-over, occasionally cantankerous, rumpled Southern suit Faulkner. If I could have only one book of fiction, it would be War and Peace; of non-fiction, it would Walden; of poetry, it would be Leaves of Grass. Once I have a polished and thoroughly revised first draft, I like to share it with four or five good readers at once and gather their feedback in quick succession. I sketch by hand, craft on the computer and then edit both ways. The semicolon. I often find my thought process landing somewhere between the flow of the comma and the assertion of the colon.